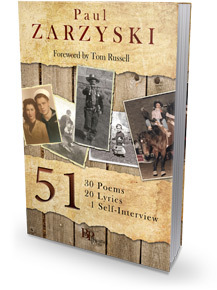 Montana has a long and celebrated tradition of artful, reflective nonfiction. From Joseph Kinsey Howard’s Montana: High, Wide, and Handsome to K. Ross Toole’s Montana: An Uncommon Land, and our own Montana: Then and Now by Aaron Parrett, we’ve been gifted with a series of erudite and sharp-eyed guides to help us see who we are. 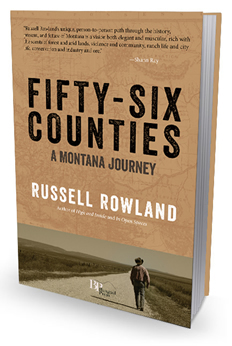 To this eminent list we can now add Russell Rowland’s Fifty-Six Counties: A Montana Journey. A native Montanan and an applauded novelist (In Open Spaces, High and Inside), Rowland spent the better part of a year studying and traveling around his beloved home state, from the mines of Butte to the pine forests of the Northwest, from the stark, wind-scrubbed badlands of the East to the tourist-driven economies of the West. Along the way, he considered our state’s essential character, where we came from, and, most of all, what we might be in the process of becoming. 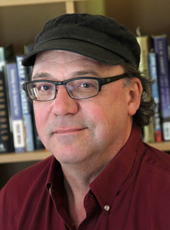 Russell Rowland is the highly-applauded author of three novels set in Montana— High and Inside, In Open Spaces, and The Watershed Years—as well as co-editor of an anthology, West of 98: Living and Writing the New American West. He lives in Billings, Montana. “Fifty-Six Counties is a remarkable book: a macro-focused narrative using a wide-angle lens. If you have room for only one book about Montana on your shelf, make it this one. The job of rewriting our past started from the beginning, with the first book ever published in Montana, The Vigilantes of Montana. Thomas Dimsdale, who was the editor of the Montana Post in Virginia City, wrote this book just after some very interesting events unfolded around him, and the book reads that way, like an article from the local sports page, as if Dimsdale was celebrating the heroic feats of the high school football team. Although much has been written about this period, my own personal favorite being A Good Orderly Lynching by Frederick Allen, the importance of these events and the way they were reported cannot be overstated. Dimsdale was a colorful writer, and by all accounts a fine reporter, but he also had to live in the same community as the vigilantes, during a time when everyone was walking those dusty streets in complete fear. Between the Native Americans and the road agents that finally inspired the vigilantes to action, and finally with the vigilantes themselves, people never knew when they might be attacked, pulled aside and questioned, beaten, or strung from a tree. Dimsdale seems to have been convinced that he was reporting the events in an unbiased manner, but he had little chance of not being biased toward the vigilantes because, when it came right down to it, his life depended on it. Those who spoke out against them—and that included two of the most prominent lawyers in the region, James Thurmond and H.P.A Smith—often found themselves chased out of town by threats of death. A few years after being exiled, Thurmond would file a defamation suit against one of the founders of the Vigilante Committee, and would win a settlement of eight thousand dollars in a Utah court. These guys didn’t like anyone pointing out when they were in the wrong, and they were often in the wrong. Toward the end of their reign, a man was hung just for expressing his disapproval of their activities. And they continued to act despite direct orders from federal judges to cease and desist. Today, at first glance, it is impossible to imagine that the sixty-mile stretch between Bannack and Virginia City could inspire the kind of greed that led to dozens of men being hung. There is nothing the least bit remarkable about the area where Bannack sits now which no doubt explains why nobody lives there anymore. But for several years this area was the number one destination for people moving West. It’s even harder to imagine when you consider that most of these pioneers traveled thousands of miles, mostly by horse and wagon, and often on foot. Before there were actual roads.